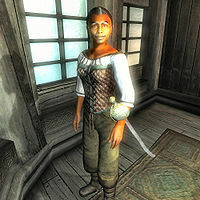 Dahlia Rackham is a Redguard bookseller found on board the Sea Tub Clarabella, which is docked in the Anvil harbor. After you have defeated all seven Red Sabre Skeletons in Dunbarrow Cove, you will receive a quest update telling you to speak with Dahlia to hire a crew. She wears a quilted doublet, sack cloth pants, a jade necklace, and a pair of leather boots. She is armed with a fine steel cutlass. Purchasing the upgrades from Dahlia are done via the "Dunbarrow Cove Upgrades" dialogue rather than using the standard purchase menu. One implication of this is that her prices are fixed and are not subject to haggling. Dahlia spends her entire day walking around the deck of the Clarabella, never eating or sleeping. Personal Quarters Upgrade 500 You now have a bed, chest, dresser, cupboard, and better lighting, all located in the Captain's Quarters. Supplier (Jak Silver) 1000 A salesman with many rare goods. Fence (Khafiz) 1000 A smuggler/fence. Will buy any stolen goods. Security Expert (Tahm Blackwell) 1000 A housebreaker, will teach you and your crew Security. Provides the security training chest. Fletcher (Melliwin the Mongrel) 1000 Marksman supplies and training. Spymaster (Kovan Kren) 1000 Has some weapons and armor for sale and also teaches Sneak. Although she does not provide a standard barter menu, it is still possible to invest in her store (using the Mercantile expert-level perk); this has no benefit other than increasing your "Stores Invested In" statistic. This bug is fixed by version 16 of the Unofficial Oblivion DLC Patches. This page was last modified on 13 July 2018, at 02:14.